The county town and administrative centre of the county. It lies at the heart of the county with roads radiating out like the spokes of a wheel. 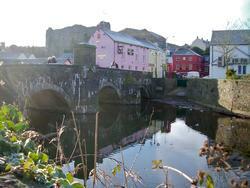 It is lively market town with a modern shopping centre built on the banks of the western Cleddau river. A fortnightly outdoor local produce market is held on Fridays. The older part of the town climbs steeply from the river up to St.Thomas’s Green where a new swimming pool has been built. This should open early in 2009. The castle dominates the town. It was built by the Normans and now only the outer shell remains. The towns museum and art gallery is situated in the grounds of the castle. Evidence of the towns maritime history can be found in the old ware-houses along the banks of the river and in the name of a riverside pub, the “Bristol Trader”. The mayor still has the title Admiral of the Port. There are a number of hotels and guest houses in and around the town, making it an excellent base for exploring the county.